Tonight’s Loi Khratang festival was an incredibly magnificent ending to an otherwise rough week. A few of us rode about 10km northeast of the city, and followed the traffic to an open field. 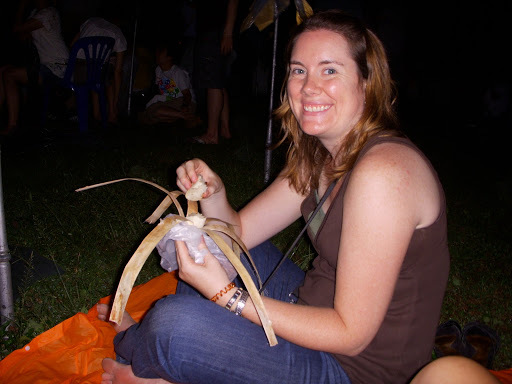 In good Thai tradition, we picked up some snacks on the way in and settled in to munch on some chicken satay and sticky coconut rice steamed in bamboo. 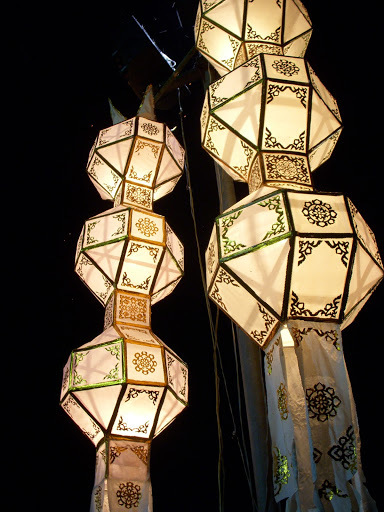 The field was dotted with rows of citronella candles on pikes, and some large decorative lanterns. Since Loi Khratong is a Buddhist festival, there were a lot of saffron-robed monks leading some chants before the lanterns were lit. 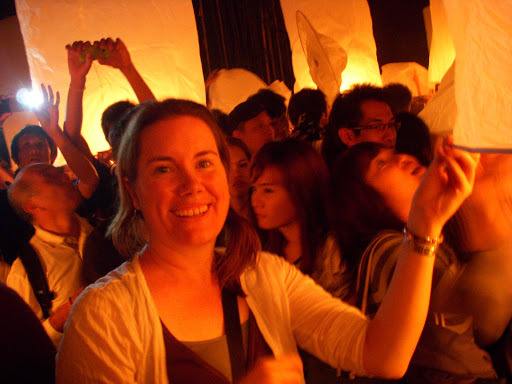 When it was time, people lit the burners (slices of toilet paper rolls dipped in flammable stuff) in the big paper lanterns with the citronella candles, and held onto them as the hot air produced by the flames filled the lanterns. When the signal was given, everyone released their lanterns at the same time. The sky was soon filled with thousands of lanterns. It was incredible. As throngs of participants “oooooohed” and “aaaaaahed”, a few matters of practical concern quickly became apparent. Some of the lanterns released in our area drifted up into the overhanging branches of a tree. Soon, chunks of flaming lantern started to fall on the crowds below. When moving out of the path of descending flames, we also had to be careful not to back up into one of the blazing citronella spikes. Amazingly, no one was injured, and a very good time was had by all. As some of the lanterns burned out, and their empty white husks drifted back to earth, I was reminded that as beautifully breathtaking as the event was, things made by human hands are so fleeting and temporary. 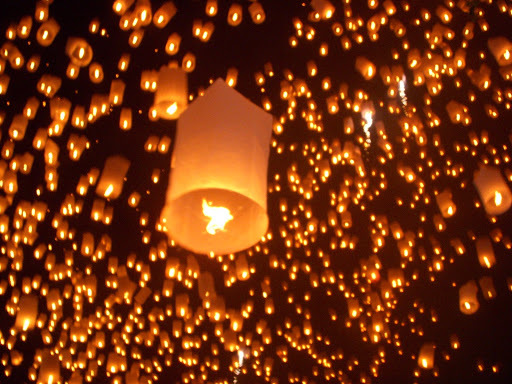 The lanterns placed when the skies were formed – like the hands that formed them – will last a great deal longer. This entry was posted in Holidays, Thailand by Janice Hillmer. Bookmark the permalink. OOOOH! What an experience! Must put that on my long long list of things to do!